The Guitar Column: Pristine 1964 Fender Vibroverb on eBay! From the folks at LA Vintage Gear comes this eBay listing for an immaculate Fender Vibroverb from 1964! According to the seller, a few caps and resistors on this amp have been replaced over its lifetime --perfectly normal as capacitors are prone to leaks or drying out after a decade -- and a JBL speaker swapped out for the original Oxford 15-inch speaker. As a bonus the seller is also including the original Oxford speaker. And every tonehound knows that a 15-inch speaker is the key to that elusive Stevie Ray sound! Crank up that Strat neck pickup because that 15 is going to make your guitar sound like you went up two string gauges. At least! Seriously, the condition of this amp is unbelievable -- even the grille cloth is a perfect, just-out-of-the-factory silver and light grey. Not bad for an amp that is 46 years old! Originally released in 1963, the first year of production saw this amp as a 'brownface' -- brown faceplate, brown knobs, light brown grille cloth and a cabinet clad in brown tolex. 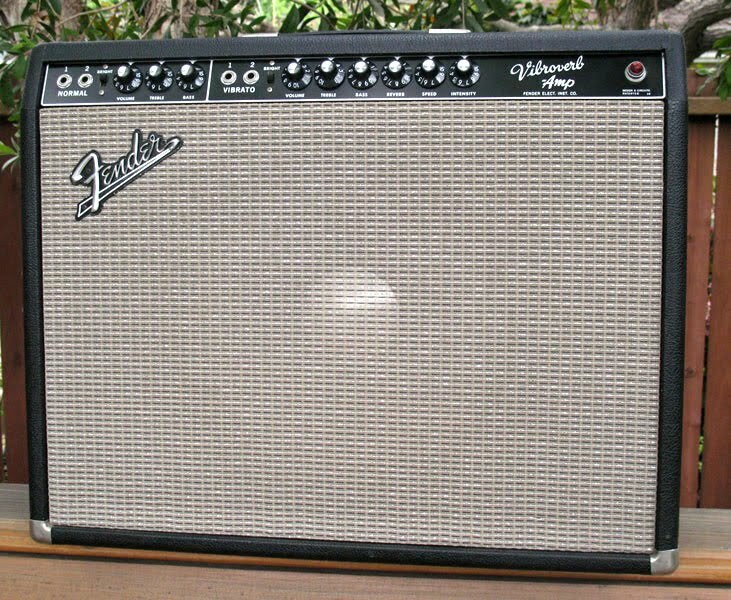 Fender switched to the classic blackface and silver grille cloth for the Vibroverb in 1964 and upped the wattage to 40W from the previous 35W on the brownface with some modifications to the tube layout. 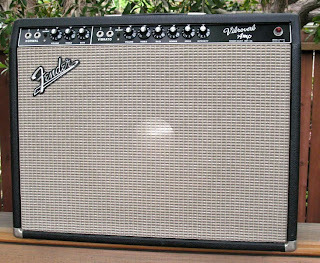 The Vibroverb was also the first amp in the Fender line to incorporate a built in spring reverb. These spring reverb tanks which Fender procured from Hammond helped define the Fender sound and indeed the guitar sounds used in pop music in general in the 60's. And it still stands that if you want a defined, ballsy reverb that doesn't wash out your guitar tones at more extreme settings, a spring reverb is still the way to go!